Having a plan for personal growth is a positive venture. 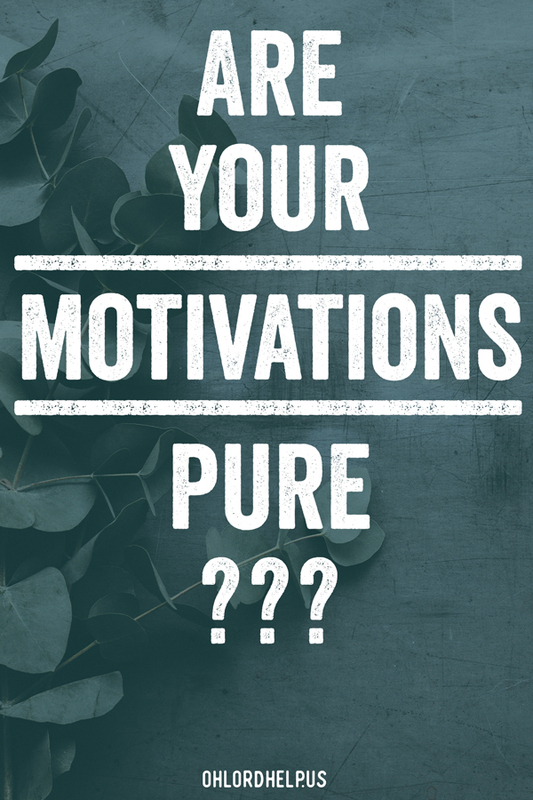 Being aware of the true motivations behind that desire can help determine the maturity actually derived from the pursuit of such goals. Some people thrive on New Year’s resolutions. Having a plan forward motivates them to be purposeful about their goals. Whether it’s wellness, organization, education, or something else entirely, the ultimate objective is self-improvement. Get your stuff together! Make your dreams come true! Crushed dreams and unrealized goals often lead to a hardness of heart. Survival instinct kicks in and before we realize it, joy for the simple things has left us and we can’t seem to take our guard down. This year, in lieu of a New Year’s resolution, I made a list. I’ve always been a fan of keeping the peace. Over the last year or two, I came to understand my motivations for being a peacemaker was oftentimes for personal gain. I aimed to make sure everyone was happy and pleased with me so I would feel comfortable, not so they would experience the peace of Christ through my tranquility. 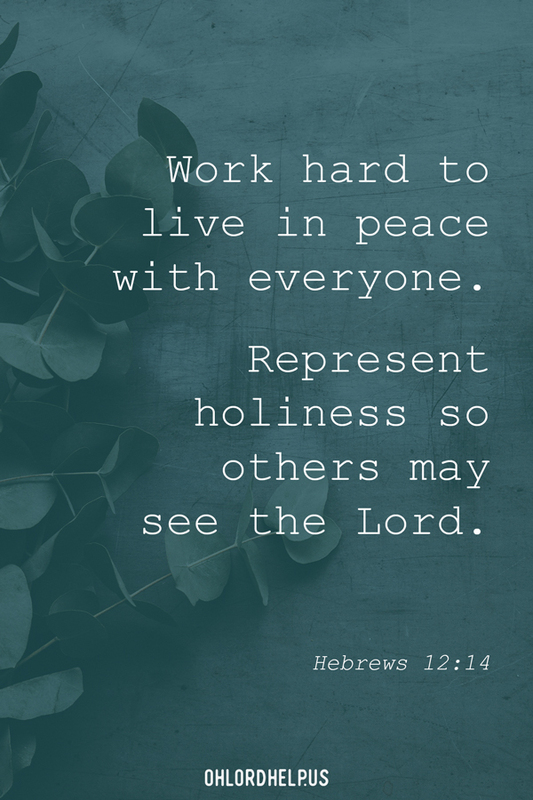 That is where the beauty of the second half of Hebrews 12:14 comes in: “and [strive] for the holiness without which no one will see the Lord.” It goes beyond giving people warm fuzzies and glitter. Those are fun gifts! Who doesn’t like to feel harmonious? Yet I am making it my aim to go one step further. Pursuing righteousness that comes from Christ for the purpose of helping others to know and believe the love God has for them, not stopping at the good vibes modern society tells us to achieve. As followers of Jesus, we are compelled to reflect Him in the very way we live our lives. That’s where my little list comes in. Psalm 119 is full of David talking about how wonderful God’s Word is and how useful it is for training in godliness. Hebrews 4:12 calls God’s Word living and active, sharper than a two-edged sword. Peppered throughout the Bible, God’s Word is described as flawless, useful for teaching and training in righteousness, a light. Matthew 24:35 says heaven and earth will pass away, but God’s Word is forever. Sister, let us hold on to and soak in that which is eternal! Yep. This is a hard one for me. I never saw the movie Anger Management, but I heard a line from it: “Sarcasm is anger’s ugly cousin.” Me? Angry? Surely not. Undoubtedly it came from crushed dreams or unrealized goals. There is a fine line between being funny and being passive-aggressive. And not to brag, but I’ve gotten pretty good at blurring the line. On second thought, that’s nothing to brag about. It’s honestly a hostile place for the heart to be. In God’s mercy, I had two friends on separate occasions call me out on it. It stung and ticked me off, but they did so in a loving way, exhorting me to “check your heart, sis” before dropping a sarcastic comment. Once again with the motivations! I am catching myself more often before letting the sarcasm fly and seeking to unearth the force behind the remarks. So far this aspect of my list has been more off-the-cuff, but also fun. The first several days in the new year I determined to have a clean kitchen before going to bed. The next week I made sure the living/dining room area was tidy. Pillows placed, couch throw folded (even if I wasn’t the one who used it), trash picked up, etc. I would argue it is universally soothing to have one clean room in your home to relax in! Then it was to make my bed every day, and so on. On the surface, these are small, yet attainable victories, but they aren’t just about me. They affect my family in a positive way that shows value. I don’t know that I would have been able to accomplish these tasks a few years ago when my children were younger. Who am I kidding? I didn’t accomplish it! And that is okay. The point is not about the action, it is about the motivations behind the action. Jesus loved us and gave Himself up for us. For me this month, a way to reflect Christ’s love to my family is finding ways to create a calm environment. We are in a busy season, full of new things and crazy growth! So for my military husband, a quiet, tidy space gives him life. For our two teenage daughters at school with 4000 other kids, having a place to relax in is rejuvenating. And for our son who is navigating what it means to be a godly son, brother, and friend, home is security. Pursue righteousness, godliness, faith, love, steadfastness, gentleness. Fight the good fight of faith. Tomorrow will hold something new. Each day we have breath, presents a fresh opportunity to exhibit the love of God in the life of someone else. It doesn’t have to be momentous. Remember who you’re doing it for. If I grab my neighbor’s trash bag from their porch and take it to the dumpster, God sees and is pleased. I don’t need to find a way to let them know it was me! May we live like we have an audience of One. I am a recovering princess and co-founder of Jonestown which is made up of my steadfast husband, Sean, and our 3 children who have all reached double digits. Embracing the value of change is a constant theme in my life. As a teen I swore I would never marry a man who was in the ministry or military. God has a beautiful sense of humor as I have been married to an Army man for nearly 18 years, and I myself am the Kids Director at our church. Motivations are tricky rascals to understand. We can immobilize our faith by trying to keep them pure and we can run over others ignoring them. I think you kept a good balance in your article allowing Scripture and God to correct our motivations. Thank you for the reminder to keep them in check.